"Our discovery reveals how small stars can be," said Alexander Boetticher, the lead author of the study, and a Master's student at Cambridge's Cavendish Laboratory and Institute of Astronomy. "Had this star formed with only a slightly lower mass, the fusion reaction of hydrogen in its core could not be sustained, and the star would instead have transformed into a brown dwarf." EBLM J0555-57Ab was identified by WASP, a planet-finding experiment run by the Universities of Keele, Warwick, Leicester and St Andrews. EBLM J0555-57Ab was detected when it passed in front of, or transited, its larger parent star, forming what is called an eclipsing stellar binary system. The parent star became dimmer in a periodic fashion, the signature of an orbiting object. Thanks to this special configuration, researchers can accurately measure the mass and size of any orbiting companions, in this case a small star. The mass of EBLM J0555-57Ab was established via the Doppler, wobble method, using data from the CORALIE spectrograph. 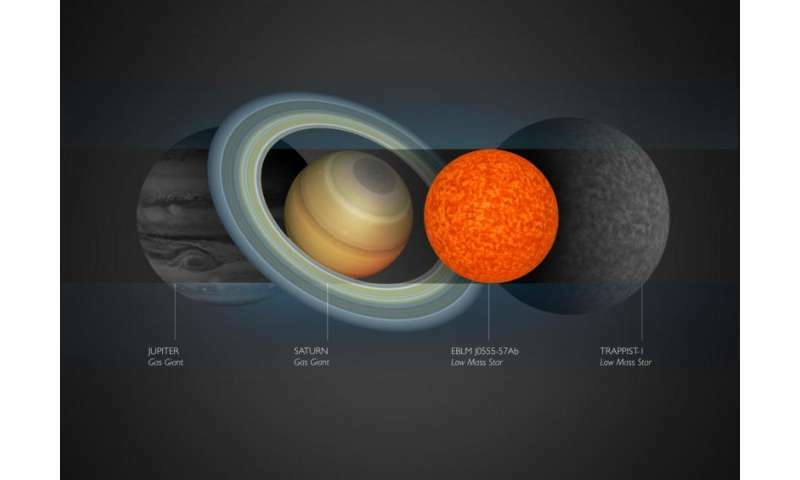 "This star is smaller, and likely colder than many of the gas giant exoplanets that have so far been identified," said von Boetticher. "While a fascinating feature of stellar physics, it is often harder to measure the size of such dim low-mass stars than for many of the larger planets. Thankfully, we can find these small stars with planet-hunting equipment, when they orbit a larger host star in a binary system. It might sound incredible, but finding a star can at times be harder than finding a planet." This newly-measured star has a mass comparable to the current estimate for TRAPPIST-1, but has a radius that is nearly 30% smaller. "The smallest stars provide optimal conditions for the discovery of Earth-like planets, and for the remote exploration of their atmospheres," said co-author Amaury Triaud, senior researcher at Cambridge's Institute of Astronomy. "However, before we can study planets, we absolutely need to understand their star; this is fundamental." Although they are the most numerous stars in the Universe, stars with sizes and masses less than 20% that of the Sun are poorly understood, since they are difficult to detect due to their small size and low brightness. The EBLM project, which identified the star in this study, aims to plug that lapse in knowledge. "Thanks to the EBLM project, we will achieve a far greater understanding of the planets orbiting the most common stars that exist, planets like those orbiting TRAPPIST-1," said co-author Professor Didier Queloz of Cambridge' Cavendish Laboratory. @avandesande2000, click the link at the bottom, everything is there. Including why they don't know the temperature. How they know it's a star; from astrophysical models and comparison with data from other objects. JongDan, so when a gas giant gets large enough to become a star it collapses into a smaller radius higher density object? ... so when a gas giant gets large enough to become a star it collapses into a smaller radius higher density object? Their estimated radius ratio of 0.85, which is more towards the lower end of things, suggests -0.163, which is definitely off the bottom of Figure 1. That would be very interesting, if further examination bears out that current estimate. So perhaps this is a very significant find. HIP 78530 b .. 24 .. 2.700 .. 740 "